A total yarding of 630 liveweight cattle this week. Export Cattle firm to 10c cheaper. Trade Cattle firm to 20c cheaper. Good yarding of cattle this week. All regular buyers operated. Best vealers 260-306 c/kg; light & medium vealers 170-240 c/kg; yearling steers 210-280 c/kg; yearling heifers 180-273 c/kg; restocker steer weaners/vealers 200-270 c/kg; restocker heifers weaners/vealers 170-230 c/kg; Export heifers 210-220 c/kg; Export steers/bullocks 220-240 c/kg; cows 150-211 c/kg. A total yarding this week of 1260 cattle with 100% clearance. Quality and condition was good overall considering the dry summer. The start of our bigger runs of weaners are now hitting the market. Overall the market was better than last month. The good yards of quality Angus Steers sold to a good market, but while you could still do some good shopping throughout. Cow & Calf market overall was very good. Buyers in attendance from Mossvale, Camden, Central Coast, Gloucester, Upper Hunter and Victoria. R&G Harris 'Mulbrae' Chads Creek had an excellent run of Angus weaners topping both steer & heifer weaner sections. 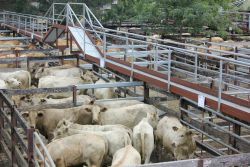 Best of his steers made $1,005 to National Stock yards, Nelsons Plains. His heifers sold for $710 to Ross Crump, Pokolbin. Please note: We had a big run of light weaners under 170kgs, that is why our prices vary so much and our average had been pulled back. A total yarding of 407 liveweight cattle this week. Export Cattle up to 40 c/kg dearer and Trade Cattle up to 35 c/kg dearer. Best vealers 300-330 c/kg; light & medium vealers 190-302 c/kg; yearling steers 225-322 c/kg; yearling heifers 175-318 c/kg; restocker steer weaners/vealers 230-315 c/kg; restocker heifers weaners/vealers 180-275 c/kg; cows 110-228 c/kg; bulls 100 -230 c/kg. A total yarding of 330 liveweight cattle this week. Export cattle trend was 5-10 c/kg dearer and trade cattle was firm to 50 c/kg dearer. Restocker cattle was also all dearer especially Angus Steer weaners that were up by 50 c/kg. Best vealers 270-310 c/kg; light & medium vealers 180-230 c/kg; yearling steers 210-290 c/kg; yearling heifers 170-271 c/kg; restocker steer weaners/vealers 200-290 c/kg; restocker heifers weaners/vealers 160-230 c/kg; cows 130-187 c/kg; bulls 150-180 c/kg. A total yarding of 300 liveweight cattle this week. Overall trend firm to 30 c/kg dearer. Trend for Export Cattle firm and Trade Cattle firm to 30 c/kg dearer on butcher vealers. Best vealers 275-348 c/kg; light & medium vealers 120-255 c/kg; yearling steers 160-305 c/kg; yearling heifers 110-278 c/kg; restocker steer weaners/vealers 165-234 c/kg; restocker heifers weaners/vealers 100-215 c/kg; export heifers 190-190 c/kg; export steers/bullocks 205-220 c/kg; cows 70-175 c/kg; bulls 180 -219 c/kg. A total yarding this week of 1013 head and 100% clearance. Quality was mixed with local weaners starting to hit the market. 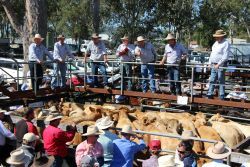 Market trend was firm to dearer on quality with the standout sale being the runs of weaners. A/c B+M Duncan, Seaham sold their 2019 run of Hazeldean blood Angus steer weaners. With the top yard weighing 306kgs and making $780 to the Wilson Family. A/c Tea Gardens Frms selling a large run of cattle due to the dry conditions with their top Angus steers making $800 and sold to Ken Allen of Clarence Town. Their yard of heifers also made $570. For more of a detailed report, please contact one of the auctioneers.